Lu Ann Cahn, despite being an eight-time Emmy award winner for Channel 10, felt overwhelmed by all the new technology that had not been available when she started her TV career decades ago. As those of us over 50 know, the learning curve for recent technology can be steep. Cahn resisted learning all these “new-fangled gadgets”, but soon realized that keeping her head in the sand or entrenching herself in this rut of resistance would not work if she wanted to stay in her field. Her daughter challenged her to get out of her rut by trying something new each day for 365 days. Cahn had thought about one new thing each week, but her daughter Alexa said it had to be every day and include posting her accomplishment on a blog. Quite an order, but as I Dare Me—her book on the experiment—demonstrates, not impossible. The book highlights many of her experiences in her Year of Firsts, from plunging into the freezing Atlantic Ocean on New Year’s Day 2010 at the age of 53 to giving out free hugs on day 162. Many of her firsts had a direct relationship to her fears. For example, she chose the Polar Bear Plunge because she had been afraid of the ocean since childhood. Confronting her fears took her out of her comfort zone, to new places she might never have been before. The book includes a list of all 365 firsts. Some are experiences that took her to other places, while some she accomplished at home or at work, such as one day without coffee or a day without cursing—both of which proved to be a stretch for Cahn. Cahn explores the many lessons she learned from this year of firsts, including feeling more present each day, and more joyful. Her book will inspire someone who is stuck, personally or professionally. There is a great deal of humanity and humbleness in I Dare Me, and the courage and conviction to move forward in life. For more information and to purchase I Dare Me, visit LuAnnCahn.com. Ellen Sue Spicer-Jacobson is a freelance writer in the field of food and health. Connect with her at Menupause.info. July 2014. 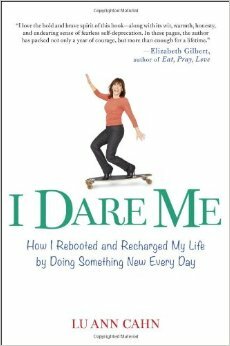 This entry was posted in DEPARTMENTS, Local Articles and tagged books, ellen sue spicer-jacobson, i dare me, july 2014, local, local bookcase, lu ann cahn, the bookcase by Healthy Living Bucks and Montgomery Counties. Bookmark the permalink.